Local Marketing, nice term, but what is it? The corporate and local marketer are at odds when it comes to their brand monitoring. Local marketers want to create independently while corporates wish to direct and standardize. In addition to irritation and inefficiency, a critical problem is a fragmented brand experience. 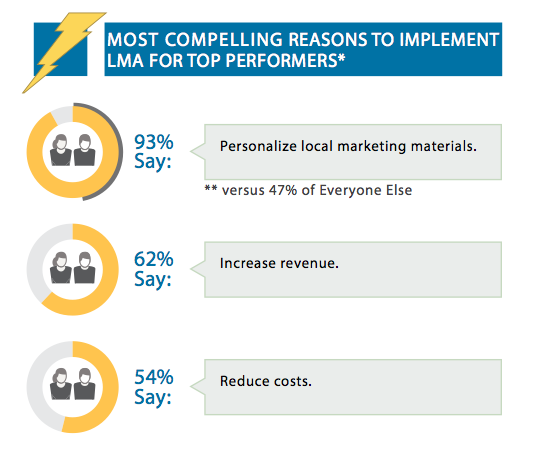 Gleanster has researched the main reasons why parties have made the step to Local Marketing Automation (LMA). Insight in marketing effectiveness: Multiple, separate toolings often perform local and corporate marketing. Because the performance data of your campaigns are stored in various places, it's impossible to analyze it accurately. Analytics in LMA gives you one central overview in the performance of your campaigns. Recognizable? We have the knowledge to set up your local marketing effectively, know the opportunities, but also understand the pitfalls. Contact us to see how you can effectively communicate regionally or view the possibilities of our local marketing software.